WindRiver Workbench is the development environment used for creating and loading C++ code onto a cRIO for FRC. This document describes how to install the Wind River Workbench environment as well as other supporting software you will need to program your robot. All images used in this document show the 2012 media, please refer to the text instructions for proper 2014 file names where necessary. This section describes how to install Wind River Workbench on a machine that has never had Wind River Workbench installed, or has had the existing installation uninstalled. If you have an existing copy of Wind River Workbench from the FRC 2013 season installed, scroll down to the "Existing Installations" section. If you wish to speed up the usage of the DVD(s) to pass to others for installation or minimize the risk of DVD drive errors stalling or aborting the installation process, you may copy the contents of the DVD(s) to a local hard disk or external drive before beginning the installation. The entire contents of the disk may be copied using Windows file copy tools, you do not need to copy the disk as an ISO then mount it. To begin the installation after copying, locate the Autorun.exe file in the root folder and double click it to launch the installer. There are two versions of Wind River Workbench provided on two DVDs in the 2013 Kit of Parts. The first DVD contains Workbench V 3.0.1, this version can be used on machines running 32-bit versions of Windows XP and Vista. Note: In order to install V3.3.1 you will also need the first DVD containing V 3.0.1, please follow all installation instructions carefully to make sure the software is installed correctly. There is a known issue with the Windriver Workbench installer running on Windows 8 requiring a work-around to complete installation. Once installed, version 3.3 of Workbench will function normally on Windows 8 machines. To install on Windows 8 read the 3 steps below before proceeding with the installation. Windows 8 only. One or more times the installer will likely freeze at a screen that looks like the one above. The common characteristic is the line showing the bspinstall.bat file. 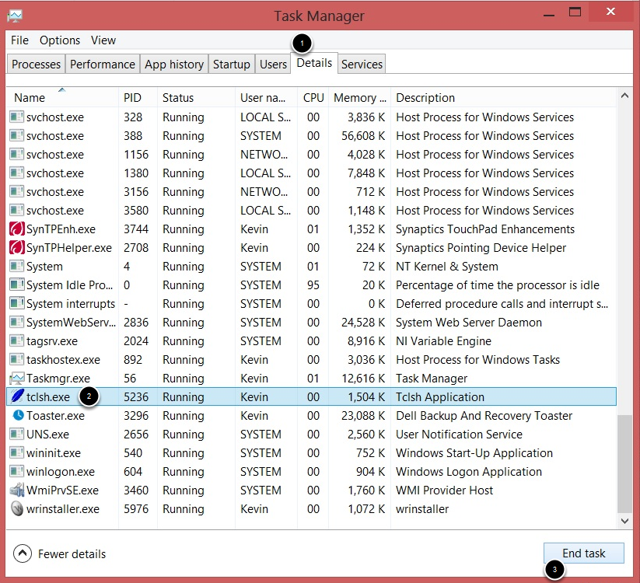 To allow the installer to proceed, press Ctrl+Alt+Delete and click Task Manager to open the Task Manager. Click on the Details tab to view a list of running processes. Locate and click to select the process "tclsh.exe" as shown above. Then click End Task and click Ok or Yes at any dialogs shown. Windows 8 only. The installer may lock-up additional times with the same signature, repeat the process shown above until the installer completes. On identical virtual machines the installer was observed to lock up between 0 and 7 times with a typical value of 1 or 2. To install either version, begin by inserting DVD 1, containing V3.0.1 into the DVD drive. The Installer-Welcome screen should launch automatically, if it does not, browse to the drive and double click setup.exe. Click Next to proceed to the next screen. On the Installer-License Agreement screen, click the radio button next to "I ACCEPT ....." indicating you agree to the terms and conditions, and then click Next. On the Installer-Installation Directory screen, keep the default installation directory C:\WindRiver. Changing this directory will prevent the WPILib Workbench Update from installing properly. Click Next to continue. If the directory does not exist, you will be asked to create it. Click Yes. On the Installer-Choose Activation Type screen, click the radio button next to Permanent Activation to select it, then click Browse. Use the dialog box to browse to the DVD drive on your computer and select the file FRC_2014_WB30_WB33_install.txt (Note: the image shows the 2012 file). Then click Open. The path to the installation file will now be filled into the text box. Click Next to continue. On this screen, click Install to begin the installation. When the installation completes click Next. Read through the Read Me displayed in the box. This is also installed in C:\Windriver as FRC_readme.txt. Then click Next. Important!! - If you are installing Windriver 3.3.1 for Windows 7 or any 64 bit version of Windows, make sure you uncheck both icons! Then click Finish. If you are installing on a 32-bit Windows XP or Windows Vista machine, proceed to the next article "Installing the FRC Specific C++ Components", otherwise continue to the next step "Installing v3.3.1 for Windows 7, 8 or 64bit Windows." If you do open Workbench 3.0 before installing 3.3 see Troubleshooting a Workbench 3.3 Installation near the end of this document. If the host operating system is Windows 7 or a 64 bit version of Vista or XP, installing DVD 2, Wind River Workbench v3.3.1 is recommended. Insert the DVD into the drive, the installer should launch automatically. If not, browse to the drive and double-click on setup.exe. The install location should match the location used for DVD 1, by default C:\WindRiver. Press OK to continue. Uncheck the checkbox next to "Check for and apply installer updates". Then click Next. Make sure the Use your existing product activation (install.txt) file is selected, then click Next. Click Next on all remaining screens until the installation is complete. The default options on these screens should not be modified. When the Wind River Workbench installation is complete, proceed to the next article "Installing the FRC Specific C++ Components". 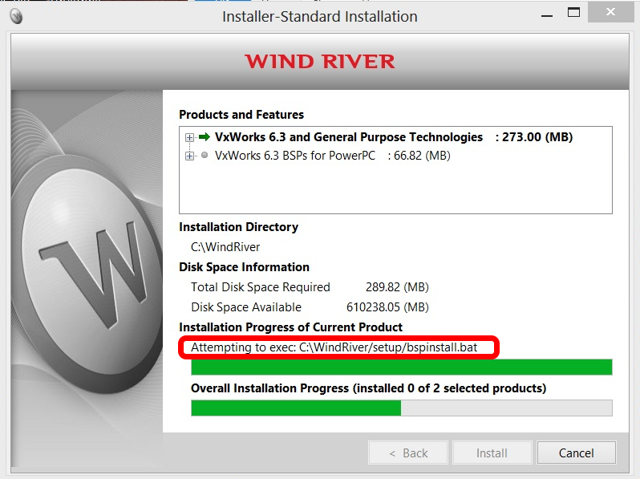 There are two possible methods to install Wind River Workbench for FRC 2014 on a system with an existing installation from 2013. The first option is to uninstall the existing installation and proceed from the Fresh Installations instructions above. The second option is to install over the existing software. Before uninstalling, it is strongly recommended to back up your existing code projects in your workspace, by default located in C:\WindRiver\workspace, to another directory. To launch the Wind River Workbench uninstaller for v3.0.1 go to Start > All Programs > Wind River > Uninstall and Maintenance > Maintenance Tool > Uninstall. Select Uninstall on the first screen, then click Uninstall on the second screen. After the uninstallation is complete, click Finish to exit. To uninstall V3.3.1 go to Start > All Programs > Wind River > Product Maintentance. Select Remove then click Next. Click Remove to begin the uninstallation. After the uninstallation is complete, click Finish to exit. To install the 2013 software proceed from the Fresh Installations instructions above. To install the 2014 Wind River software over the 2013 software, start by inserting DVD 1 V3.0.1 into the DVD drive of your machine. The Installer-Welcome screen should launch automatically, if it does not, browse to the drive and double click setup.exe. Click Next to proceed to the next screen. The installer should detect your existing installation and show this screen. Select Enter new activation information then click Next. On the Installer-Choose Installation Filters screen, select Custom Installation, then click Next. On the Installer-Custom Installation Page, place a check next to each item, then click Install. Important!! - If you are installing Windriver 3.3.1 for Windows 7 or any 64 bit version of Windows, make sure you uncheck both icons! Then click Finish. The installation of v3.0.1 from DVD 1 will upgrade the license file for 2014 for both versions of Workbench. No additional steps are necessary for using v3.3.1. Proceed to the next article "Installing the FRC Specific C++ Components"
Make sure Workbench 3.0 is closed. Shut down the Wind River Registry for Workbench by locating the icon in your task bar, right-click it, then select Shut Down.